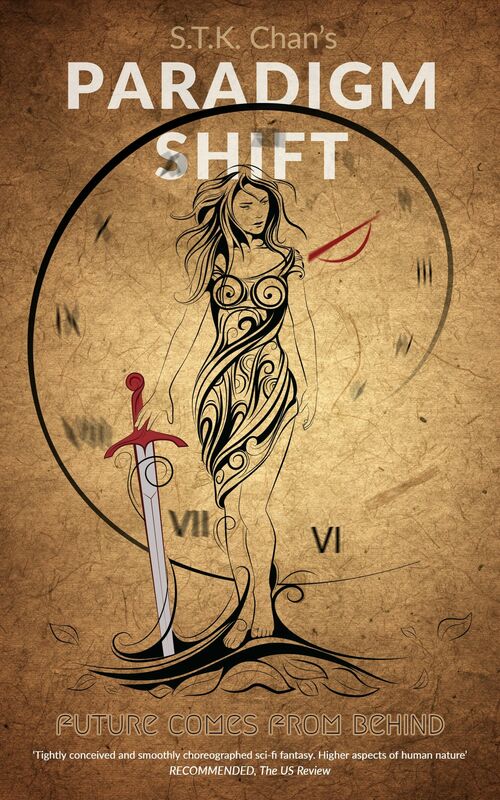 Two major themes of the SF Fantasy genre: the battle between good and evil and the time travel and its possible repercussions are entwined by STK Chan in a way in which made the public and editors to identify some Metaphysical Visionary touches and Sword & Sorcery elements. But what it’s worth mentioning about Future Comes from Behind is the way in which the author approaches the themes and manipulates these (sub)genres. This approach brings enough originality to make the story interesting. The “scientific” aspects are mixed with the magical ones in a context in which the quest for a better world is influenced by the main protagonist’s own growth. The personal stakes, usually present in S&S, are replaced with general interest for the fate of the whole world. And what a better way to add the SF elements if not by time travel controlled, more or less, by the characters. But once again, there is a quite amount of “non-science” in this time –travel when the body-mind–soul have a say in it. For the benefit of the story (and the readers), all these do not happen in a vapid way. While offering plenty occasions for some quite philosophical “debates”, the story is fast-paced, even if, from time to time, we received the author’s explanations and opinions directly, instead of them being offered by deduction from the actions of the characters/story. The author even teases us with the possibility of a romance. Between the different time-lines and different moments, more or less inspired by real history, the characters are enough profiled in order to connect with them, but there is still room for more depth. And because I have mentioned history, I have to say that, as a descendant of the Dacians “the bravest and the most righteous among the Thracians” (as Herodotus said) it was a nice surprise to meet them here. For sure, one thing is clear: even from the title (and also the name of the series), Future Comes from Behind promises something different and, hidden into the action, possible different meanings. It’s on you to discover all of them… and… if we didn’t learn from the history, in Future Comes from Behind we have a chance to change the past… it remains to be seen if the consequences of changing it are for the better or worse. For sure, I’ll check the next volume/s. Thanks for hosting! and Happy New Year! Love books that jump timelines. Thanks! Enjoyed the review. Sounds really interesting. The cover is good too. Oooohhhhh! The book cover looks so interesting. This book sounds like a really intriguing read. Great review! Sounds very interesting!